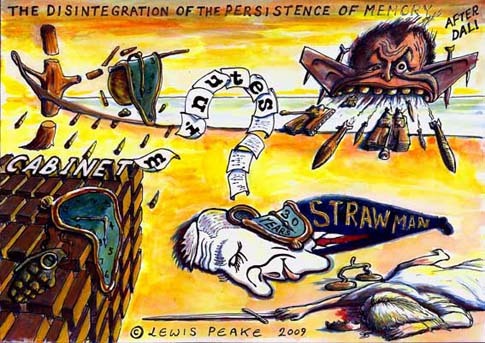 This piece of artwork was inspired by Jack Straw's decision to block the release of the Iraq War minutes - almost exactly a year after being ordered to release them. Jack Straw is England's current Justice Secretary. The famous Dali painting that also inspired this cartoon is called the "Persistence of Memory" because it has what looks like a cabinet with clocks - the headline here was about cabinet minutes! Dali did a later one with an oxymoronic but perfect title "Disintegration of the Persistence of Memory." But that's exactly what's going on in this cartoon: The bad memory persists and Straw wants to erase it. Blair is in the background of course spewing forth the dogs of war. The final touch is Lady Justice, violated and sprawled in front of the smug Straw - Blair's pathetic straw man.